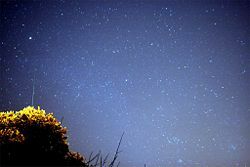 Photo of a part of the sky during a meteor shower over an extended exposure time. The time lapse between individual meteors may be in the range of several seconds to several minutes. A meteoroid is a small body of debris in the Solar System, roughly ranging in size from a sand grain to a boulder. If the body is larger, it is called an asteroid; if smaller, it is known as interplanetary dust. The bright streak of light that appears when a meteoroid enters Earth's (or another body's) atmosphere is called a meteor, also referred to as a shooting star or falling star. A group of meteors appearing around the same time is called a meteor shower. The root word meteor comes from the Greek meteōros, meaning "high in the air." Tiny meteoroids continually enter the Earth's atmosphere, practically every few seconds in a given area. Fortunately, the atmosphere acts as a shield that protects living organisms from bombardment by most meteoroids. A meteor (possibly two) and Milky way. The current definition of a meteoroid given by the International Meteor Organization (IMO, an amateur organization that studies meteors) is, "A solid object moving in interplanetary space, of a size considerably smaller than an asteroid and considerably larger than an atom or molecule." The Royal Astronomical Society has proposed a new definition, where a meteoroid is between 100 micrometers (µm) and ten meters (m) across. The near-earth object (NEO) definition includes larger objects, up to 50 m in diameter, in this category. A meteor is the brightly visible pathway of a meteoroid or asteroid that enters Earth's atmosphere. (Occasionally, the falling object itself is called a meteor, but that is incorrect.) For bodies that are larger than the atmospheric mean free path (ten cm to several meters), the visibility is due to the heat produced by the ram pressure (not friction, as is commonly assumed) of atmospheric entry. Since the majority of meteors are from small (sand-grain size) meteoroid bodies, most visible signatures are caused by electron relaxation following the individual collisions between vaporized meteor atoms and atmospheric constituents. A meteorite is the portion of a meteoroid or asteroid that survives its passage through the atmosphere and strikes the ground without being destroyed. Meteorites are sometimes, but not always, found in association with hypervelocity impact craters. During energetic collisions, the entire impactor may be vaporized, leaving no meteorites. Many meteoroids are formed by impacts between asteroids. Also, many are left in trails behind comets that form meteor showers, and many members of those trails are eventually scattered into other orbits forming random meteors. Other sources of meteors are known to have come from impacts on the Moon or Mars, as some meteorites from them have been identified. The definition of a fireball varies in the literature, but it is roughly defined as an unusually bright meteor. The Fireball Data Center (FIDAC) of the International Meteor Organization regards fireballs as "meteors of at least apparent magnitude -3 mag (corrected for zenith position)." This definition corrects for the greater distance between an observer and a meteor near the horizon. For example, a meteor of magnitude -1 at 5 degrees above the horizon would be classified as a fireball because if the observer had been directly below the meteor it would have appeared as magnitude -6. Astronomers may use the term bolide when referring to an exceptionally bright fireball, particularly one that explodes (sometimes called a detonating fireball). The word bolide comes from the Greek βολις (bolis), which can mean "a missile" or "to flash." The International Astronomical Union has no official definition of bolide and generally considers the term synonymous with fireball. The term is more often used among geologists than astronomers, where it means a very large impactor. For example, the United States Geological Survey (USGS) uses the term to mean a generic large, crater-forming projectile "to imply that we do not know the precise nature of the impacting body ... whether it is a rocky or metallic asteroid, or an icy comet, for example". Molten terrestrial material "splashed" from a crater can cool and solidify into an object known as a tektite. These are often mistaken for meteorites. Most meteoroids are destroyed when they enter the atmosphere. The left-over debris is called meteoric dust or just meteor dust. Meteor dust particles can persist in the atmosphere for up to several months. They might affect climate, both by scattering electromagnetic radiation and by catalyzing chemical reactions in the upper atmosphere. During entry of a meteoroid or asteroid into the upper atmosphere, an ionization trail is created, as molecules in the upper atmosphere are ionized by the passage of the object. Such ionization trails can last up to 45 minutes at a time. Small, sand-grain sized meteoroids continually enter the atmosphere, essentially every few seconds in a given region. Thus ionization trails can be found in the upper atmosphere more or less continuously. When radio waves are bounced off these trails, it is called meteor burst communications. Meteor radars can measure atmospheric density and winds by measuring the decay rate and Doppler shift of a meteor trail. Meteoroids and asteroids orbit around the Sun, in greatly differing orbits. Some of these objects orbit together in streams; these are probably comet remnants that would form a meteor shower. Other meteoroids are not associated with any stream clustering (although there must also be meteoroids clustered in orbits that do not intercept the orbit of Earth or any other planet). The fastest objects travel at roughly 42 kilometers per second (km/s) (26 miles per second) through space in the vicinity of Earth's orbit. Together with the Earth's orbital motion of 29 km/s (18 miles per second), collision speeds can reach 71 km/s (44 miles per second) during head-on collisions. This would occur only if the meteor were in a retrograde orbit. Meteors have roughly a 50 percent chance of a daylight (or near daylight) collision with Earth, as Earth orbits in the direction of roughly west at noon. Most meteors are, however, observed at night, as low light conditions allow fainter meteors to be observed. A number of specific meteors have been observed, largely by members of the public and largely by accident, but with enough detail that orbits of the incoming meteors or meteorites have been calculated. All of them came from orbits from the vicinity of the Asteroid Belt. Perhaps the best-known meteor/meteorite fall is the Peekskill Meteorite, which was filmed on October 9, 1992, by at least 16 independent videographers. Eyewitness accounts indicate that the fireball entry of the Peekskill meteorite started over West Virginia at 23:48 UT (±1 min). The fireball, which traveled in a northeasterly direction had a pronounced greenish color, and attained an estimated peak visual magnitude of -13. During a luminous flight time that exceeded 40 seconds, the fireball covered a ground path of some 700 to 800 km. One meteorite recovered at Peekskill, New York, for which the event and object gained its name, (at 41.28 deg. N, 81.92 deg. W) had a mass of 12.4 kg (27 lb) and was subsequently identified as an "H6 monomict breccia meteorite." The video record suggests that the Peekskill meteorite probably had several companions over a wide area, especially in the harsh terrain in the vicinity of Peekskill. Over the years, numerous people have reported hearing sounds while bright meteors flared overhead. This would seem impossible, given the relatively slow speed of sound. Any sound generated by a meteor in the upper atmosphere, such as a sonic boom, should not be heard until many seconds after the meteor disappeared. However, in certain instances, for example during the Leonid meteor shower of 2001, several people reported sounds described as "crackling," "swishing," or "hissing" occurring at the same instant as a meteor flare. Similar sounds have also been reported during intense displays of Earth's auroras. Many investigators have dismissed the sounds as imaginary—essentially sound effects added by the mind to go along with a light show. However, the persistence and consistency of reports have caused others to wonder. Sound recordings made under controlled conditions in Mongolia in 1998 by a team lead by Slaven Garaj, a physicist at the Swiss Federal Institute of Technology at Lausanne, support the contention that the sounds are real. How these sounds could be generated, if they are indeed real, remains something of a mystery. It has been hypothesized that the turbulent ionized wake of a meteor interacts with the magnetic field of the Earth, generating pulses of radio waves. As the trail dissipates, megawatts of electromagnetic energy could be released, with a peak in the power spectrum at audio frequencies. Physical vibrations induced by the electromagnetic impulses would then be heard if they are powerful enough to make grasses, plants, eyeglass frames, and other conductive materials vibrate. This proposed mechanism, although shown plausible by laboratory work, remains unsupported by corresponding measurements in the field. Even very small meteoroids can damage spacecraft. The Hubble Space Telescope for example, has over 100 tiny craters and chipped areas. A green and red Orionid meteor striking the sky below Milky Way and to the right of Venus. Zodiacal light is also seen at the image. The brightest meteor, a fireball, leaves a smoky persistent trail drifting in high-altitude winds, which is seen at the right-hand side of the image of an Orionid. ↑ Glossary, International Meteor Organization IMO. Retrieved January 4, 2017. ↑ M. Beech and Duncan I. Steel, On the Definition of the Term Meteoroid Quarterly Journal of the Royal Astronomical Society 36(3) (1995): 281–284. Retrieved June January 4, 2017. ↑ Fireball Observations International Meteor Organization. Retrieved January 4, 2017. ↑ What is a Bolide? USGS. Retrieved January 4, 2017. ↑ The Peekskill Meteorite and Fireball. uregina.ca. Retrieved January 4, 2017. ↑ The Peekskill Meteorite October 9, 1992 Videos aquarid.physics.uwo.ca. January 4, 2017. ↑ F. Wlotzka (1994), Meteoritical Bull, Meteoritics 75:28:5:692. ↑ Witness Accounts. 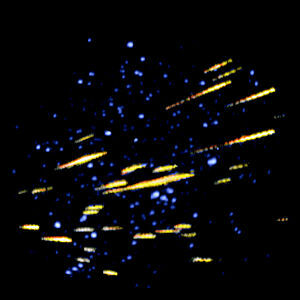 Nov. 18, 2001 Leonid Meteor Sounds. Natural History. Retrieved January 4, 2017. ↑ Meteoroids Enchanted Learning. Retrieved January 4, 2017. This page was last modified on 19 September 2018, at 15:49.